On Friday, April 5, please join the NGO Peace Boat and the UN Office for Disarmament Affairs for a lunchtime discussion with Emilie McGlone, the Director of Peace Boat US, and Selina Neirok Leem, one of the organization’s Ocean and Climate Youth Ambassadors. 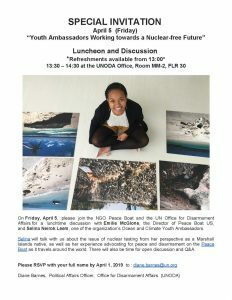 Selina will talk with us about the issue of nuclear testing from her perspective as a Marshall Islands native, as well as her experience advocating for peace and disarmament on the Peace Boat as it travels around the world. There will also be time for discussion and Q&A. As one of the Ocean and Climate Youth Ambassador for Peace Boat, she embarked the ship in Barcelona, where the young leaders engaged with local, regional and national governments, civil society and the scientific community taking part in awareness raising and outreach events in ports visited, including in France, Portugal, the United Kingdom and Iceland, concluding their voyage in New York. 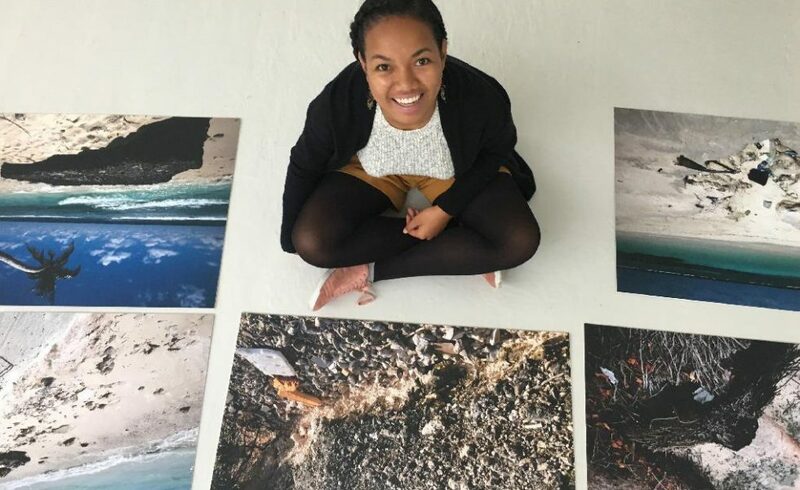 Until she was 16 and moved to Germany to school at UWC Robert Bosch College where she recently graduated from, Selina spent her entire life on her home atoll, Majuro. Representing the Marshall Islands, Selina was the youngest delegate at the COP21 in Paris. During the closing remarks, then Marshall Islands Foreign Minister Tony deBrum gave her the opportunity to give the final statement. She said the Paris agreement, “should be the turning point in our story; a turning point for all of us.” Last year, she shared the stage at the Skoll World Forum in Oxford, England with former US Vice-President Al Gore and former President of Ireland, Mary Robinson. Selina has given interviews, written articles, poems, and given spoken word performances about the situation in her country. She is personally connected to climate change and has made it her duty to be an advocate and hopes to continue to grow as an advocate. Working with Peace Boat since 2004, Emilie is currently the United Nations liaison and Director of the New York-based office of Peace Boat US, a non-profit organization working to promote peace, sustainable development and respect for the environment through educational programs organized onboard the Peace Boat, a chartered passenger ship that travels the world on peace voyages. Peace Boat holds Special Consultative Status with the Social and Economic Council of the United Nations and works in partnership with UN representatives, Nobel Peace Laureates and community leaders from around the world to create opportunities for international cooperation focused on environmental sustainability, cultural awareness and peace education. Emilie works to foster youth education and develops specific programs to learn about important global issues onboard the Peace Boat. Founded in 1983 and nominated for the Nobel Peace Prize in 2008, Peace Boat has sailed on over 100 global voyages, carrying more than 60,000 people to more than 100 countries. Peace Boat has recently launched a new initiative to build an Ecoship to sail around the world, showcasing green technology and design, while inspiring positive change to radically reduce our carbon footprint. Peace Boat is a committed campaigner for the UN Sustainable Development Goals, sailing with the Global Goals Logo on the hull of the ship. Peace Boat’s Ecoship Project will build the world’s most sustainable passenger ship. A flagship for the SDGs, Ecoship seeks to address ocean acidification with reduced carbon emissions and significantly reduce marine pollution.